This Miniature Pumpkin Wicker Basket Display diminutive decorative offerings cornucopia-like for all passersby. At least I assume the main use of miniature pumpkins is decorative, because for cooking wouldn’t one big pumpkin be the size of choice? Please educate me if I am wrong. 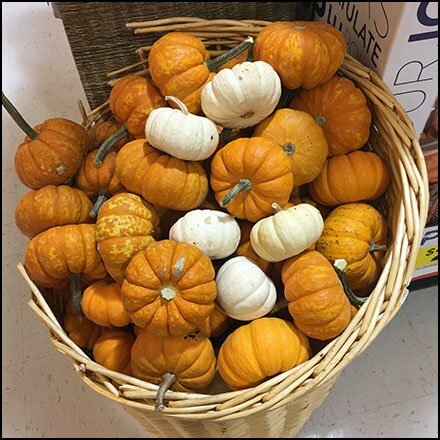 Meanwhile this Miniature Pumpkin Wicker Basket Display seen at Giant, Bartonsville, Pocono Mountains PA.